Here’s a new product that’s thousands of years old. Soapnuts are actually the fruit of the Sapindus tree that grows naturally in parts of Asia and India. The fruits have been utilized for countless generations by native peoples. The nuts (which are about the size of a grape) are harvested and dried and then used as a natural cleaning agent for the laundering of clothes and in other household cleaning applications. The advantages of using soapnuts for doing your laundry are that it contains no additives, pollutants, or chemicals that might be harmful to your body or to the environment. Soapnuts can be purchased at any number of “green stores”, health food outlets, or by ordering online. The soapnuts usually come with a small cloth bag that has a drawstring at the top. Into this bag, a few (about 3 to 5) soapnuts are placed and the bag and contents are then added to your load of laundry in place of standard chemical laundry detergents. The soapnuts do produce a very small amount of suds in the process of agitation inside the washing machine. They can be used effectively in front loaders, top loaders, and in the newer high efficiency washing machines. Claims are that the soapnuts have the same cleaning power as chemical detergents, but without all the health and environmental concerns. Also, no fabric softeners or dryer sheets are needed in the course of laundering your clothes with soapnuts. The soapnuts have essentially no odor and thus transfer no discernable scent to the fabric in the process of cleaning your garments and towels. Some say laundering your clothing with soapnuts also produces an added softness in the fabrics. Also, a small stain of chocolate on one garment was satisfactorily cleaned. Some of the suppliers of soapnuts caution that you may indeed have to add a bit of stain remover to some heavily soiled garments in order to achieve overall cleaning when using the soapnuts as a detergent substitute. Soapnuts are said to be safe for gentle or sensitive skin. And on a cost per load basis, they appear to be cheaper than chemical detergents. 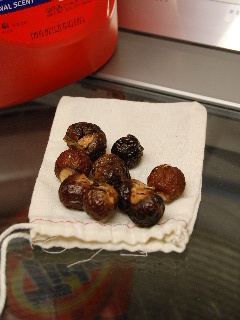 The soapnuts in the little cloth bag can be used repeatedly to do several loads of laundry before the contents need to be discarded and replaced with a new batch of 3 to 5 fresh unused soapnuts. You might want to give them a try and see what kind of results you get from this natural age-old cleaning product.